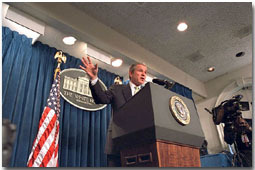 ...since the end of George W. Bush's last press conference with open questions on American soil. It's 12 o'clock (GMT-5)... do you know where your President is? ** There is strong reason to believe that the question-and-answer section of the 6 March 2003 "Press Conference" was scripted. If it happened once, it probably happened multiple times.